On May 18th, Morehouse College celebrated its 150th Anniversary with the “Journey of the Sesquicentennial Torch of Excellence” in Augusta, Georgia. The torch, which holds the College’s sacred “Candle in the Dark”, was lit during a ceremony at Springfield Baptist Church, where Morehouse College was founded by Rev. William Jefferson White in 1867. The torch traveled down Reynolds Street in Augusta and then headed to Atlanta for the 2017 Morehouse College Commencement Ceremony. 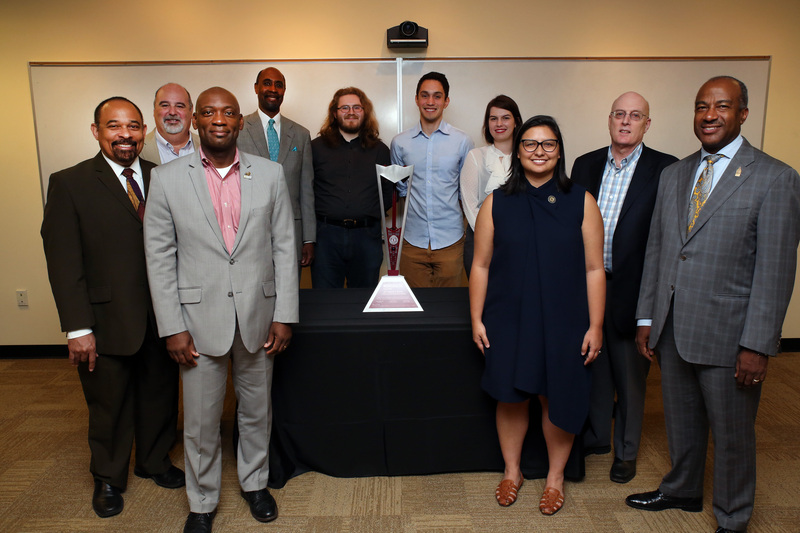 The Sesquicentennial Torch of Excellence, commissioned by the leadership of Morehouse College, was designed and constructed through a collaboration between faculty and students at Georgia Tech and Morehouse College. The project was originally conceived of by Dr. Keith Hollingsworth and the team of students was advised by Dr. Katherine Fu, Assistant Professor in the Woodruff School of Mechanical Engineering, and Dr. Willie Rockward, Associate Professor and Chair of Physics & DDEP at Morehouse College. The team of students included four Woodruff School mechanical engineering students: Eli Brand, then a senior, now an alum; David Gamero, junior; Joshua Von Holtz, junior; Veronica Spencer, alum and MID candidate, and two Morehouse physics students: Jared Mitchell and James Stukes. The project was supported by the Woodruff School Chair, Dr. William Wepfer, and the College of Engineering Dean, Dr. Gary May. “The relationship between Georgia Tech and Morehouse goes back decades, notably through our Dual Degree Engineering Program (DDEP). Reaffirming that partnership through my collaboration with Dr. Rockward for this historic event was a once in a lifetime opportunity – the end product of which I couldn’t be more proud,” said Dr. Fu. A Torch of Excellence was presented to Chair Wepfer and Dean May to signify the continued successful partnership between Georgia Tech and Morehouse. In attendance were the Provost of Morehouse, Dr. Michael Hodge, and the late Interim President of Morehouse, Dr. William Taggart. Dr. Taggart served Morehouse College with distinction for two years, providing steady leadership and leaving behind a legacy of compassion, integrity and devotion. Dr. Fu and Dr. Rockward assembled a team of Woodruff School and Morehouse students, tasked with creating a torch that would signify Morehouse College’s role as a beacon of education, leadership and service for more than 150 years. 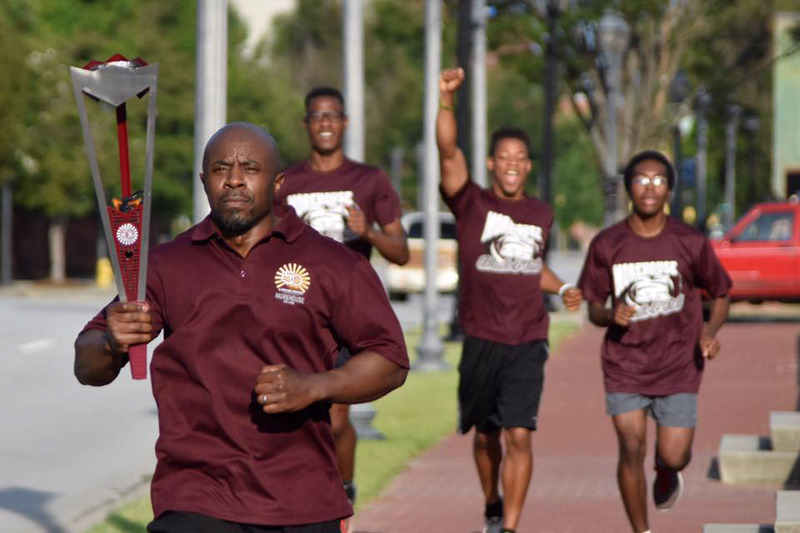 Faced with a one semester time-line, the team set out to design a torch that encompassed the spirit of Morehouse College and that would also house a GPS tracker for location, a camera for live-streaming, and have the capability of surviving a 150 mile relay with the flame intact. As the design phase progressed, the team incorporated the aesthetics of Morehouse College – strong, masculine geometry, sophisticated accents and strong cultural and historical influences – and developed a gyroscope subassembly to hold gel fuel, a fuel source that has never before been utilized in relay torch design. The torch was equipped with a 3-D printed electronic enclosure for the GPS and camera, and displayed the Morehouse 150th Anniversary Celebration Emblem. “Early forms were inspired by the interpretation of the Morehouse Man, and the unique history of the college. Through a series of prototypes and iterations, the design was able to merge with the engineered fuel and electronics systems,” said team member Veronica Spencer. Created from powder-coated aluminum with a cloth wrapped handle, the torch stands at a height of 26.5 inches with a weight of 1.6 pounds. Fabrication of the actual torches and stands was completed over the course of two weeks in the Woodruff School’s Invention Studio, and logged in 500 person-hours. “Every part of the torch and the stands was made in either the Invention Studio or the Montgomery Machining Mall. Although the build was very challenging, we had a strong and talented team and incredible support from the school and our advisors,” said team member Eli Brand. The team plans to find a place to display the Georgia Tech - Morehouse commemorative Torch of Excellence within the Woodruff School.